Typoman developer Brainseed Factory, via the PlayStation Blog, has announced a new PSVR game that’s all about slowing down, relaxing, and squishing adorable, little alien buddies. 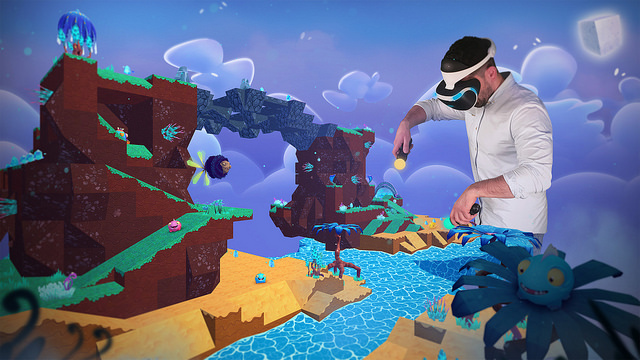 Squishies, which is launching for the PlayStation VR on November 20, 2018, is a puzzle-platformer that sees the player using vacuum-powered, robot alien fish to guide the titular creatures around a colorful world. The Squishies are lost, you see, and all they want to do is get back home. So it’s up to you and your chariot-looking robot-slash-alien-fish setup to guide the Squishies around various hazards and obstacles through goal gates at the end of each level. Besides “sitting in your living room looking like a Power Ranger petting small animals,” Squishies will also let you create your own levels using a level editor tool that is, according to the blog post, the exact same tool used by the developers to design the official levels. Not only will players be able to design their own levels, they will also be able to share their creations with the community. Feel free to check out the trailer, which hints at the power of your Squishie-guiding, vacuum-powered, transdimensional fish arms (PlayStation Move controllers). We’ve also gathered screenshots from the blog post, as well as the game’s official website, which you can browse below.